Caring for a spouse, parent or loved one with Alzheimer’s disease, dementia or memory loss is challenging and requires a commitment to face each day with patience, flexibility and compassion. Often these conditions require caregivers to seek an additional level of support to ensure the well-being of a loved one. It’s hard to watch someone you love face memory decline. It shouldn’t be hard to find the best possible care and lifestyle. Pineview Cottage offers those with Alzheimer’s disease, dementia and other memory challenges a beautiful, lifestyle-focused community where remarkable people who understand all stages of memory loss provide exceptional care. Owners/Managers Dean and Hilde Bonesteel, RN, have a long history of leadership in innovative care for residents with memory loss. Pineview Cottage Memory is a state-of-the-art memory community that’s been designed to look and feel like home. We’ve created a therapeutic environment—a place that lovingly supports people in being who they are. We promote awareness in the way we understand aging, growing old and the role of eldership. 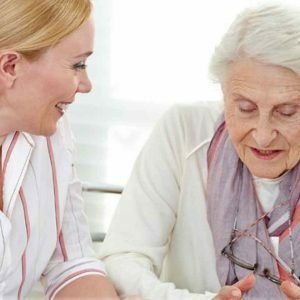 Dementia/Alzheimer’s care, specialized behavioral and emotional care, hospice, and transitional care coordination all are available to our residents. By offering a lively, balanced schedule of programs, classes and events, we make sure that residents enjoy each day to the fullest. Residents bring their own furniture and belongings to make their apartments feel like home. Enclosed courtyards provide a safe, secure environment where Residents can enjoy the outdoors. Families have peace of mind knowing that their loved ones are receiving the best care possible. Life Skill Stations engage residents socially, encourage cognitive exercises, help sustain long-term memories, and improve residents’ quality of life. As we look for ways to improve the quality of life for our residents, “life skill stations” have been designed to “spark memories.” The goal of life skill stations is to create small vignettes that help dementia residents spark old memories and create activities that encourage interest, movement, and interaction. PURPOSE: To provide support to those living with dementia and those touched by Alzheimer’s disease. This disease has taken so much from us, we need to fight back against this most feared disease. Join us as we empower those with forgetfulness—learning ways to enter into their world and not make them live in ours.